Situated at 0.370440° N, 35.370302° E. (Easy to find on Google Earth). As the crow flies at 20 km south-south-east of Eldoret, and 7 km south of Nundoroto Farm (15 km by road). Nundoroto Farm in Plateau village is the Kenyan “base” from where the "Kenya naar School" projects have started and are being guided/assisted. 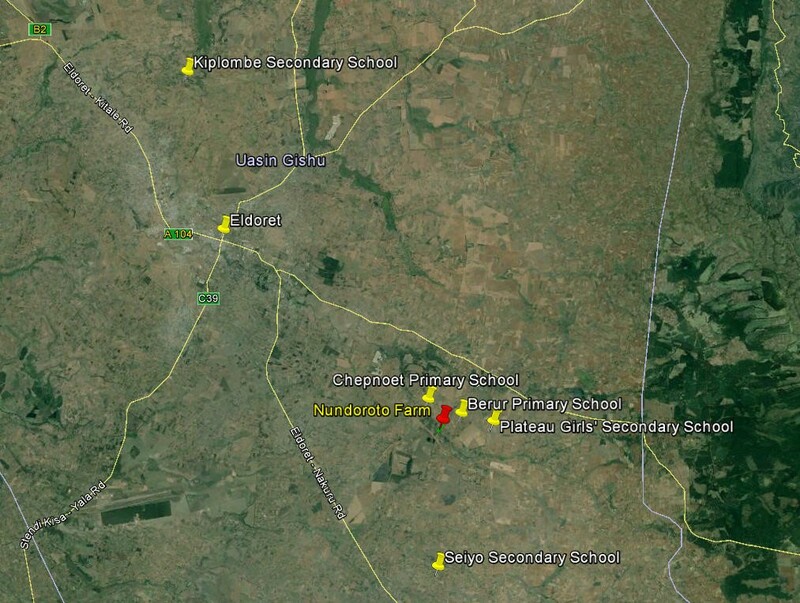 The projects that have been assisted sofar as well as Seiyo Secondary School are indicated on the map below. Seiyo Secondary School has 8 acres of land, registered in the name of the school. The school is situated next to a Primary School. Some pictures of the actual situation at the school. Seiyo Secondary School is at this very moment a “mixed day school”, therefore a school frequented by boys and girls, who are going home every day and who live at home. The school was founded in 2009 and has 116 students. In 2009 the school used the buildings of the adjacent Reformed Church and the adjacent primary School. At this moment the school has 6 classrooms, a laboratory under construction (but no funds to complete the construction) and a provisional space where the administration is housed and where teachers can work. There are some toilets (pit latrines). There is also a provisional kitchen that prepares lunches for the students. The school has a Director and six teachers, paid for by the government. The parents are paying the salaries of another four teachers. There is furthermore an administrator, two cooks and a watchman. There is a well, that supplies the school with water throughout the year. There is no electricity yet, but it is scheduled to be provided with the assistance of government funding. The financial situation of the school leaves much to be desired. There appears to be a vicious circle: The school does not have enough students, and is thus provided with (too) few teachers. The school fees paid by the parents are lagging behind, hence the constructions cannot be completed, while there is a high turnover amongst the teachers who are paid by the parents. This is probably an indication that their salaries are too low. There are too few books and study materials available. The involvement of the parents is rather limited. This can be seen from the little attendance at parent-teachers meetings and substantial arrears in paying the school fees of their children. The students show little personal discipline. There is a high rate of absenteeism. There are also plenty of (teenager) pregnancies amongst the students. Gender problematics: the boys are now lagging behind. 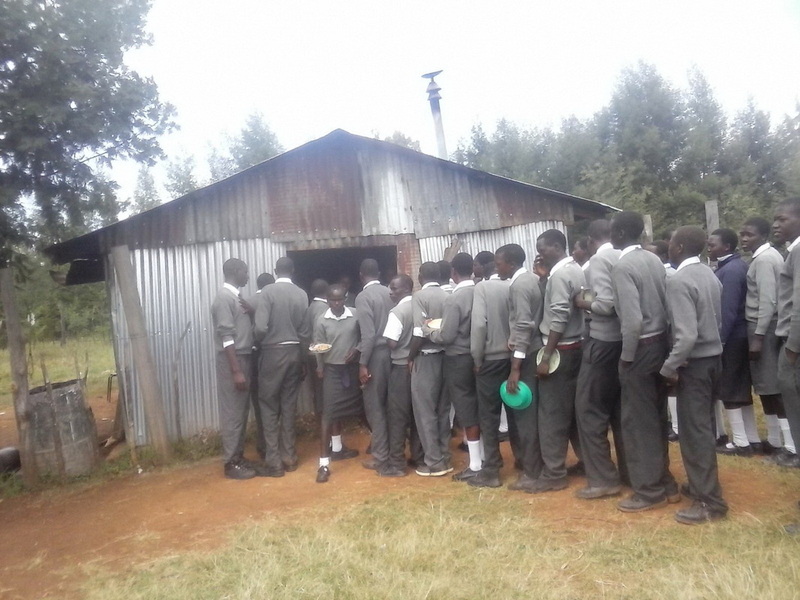 Limited research, amongst others by the Educational Department of Uasin Gishu County Council, has shown that there are no really good performing Secondary Schools for boys in the region. The past emphasis on schooling possibilities for girls has now resulted in risking boys education lagging behind. In the Cheptiret area, where Seiyo Secondary School is situated, many boys prefer to start working after the Primary School. On the one hand the money is beckoning, while the education at a secondary school adds very little and hardly seems to create better chances on the other hand. For many boys in the area, their ambition is limited to buying a motorbike and than make some money as a "motorbike taxi" driver. However with the increased number of motorbikes, the competition increases and the earnings fall. The model of Plateau Girls School, which has been assisted and "adopted" by the Foundation, can serve as an example: a very poorly performing school that attracted more and more students through the improvement of its facilities while obtaining increasingly good academic results. This has resulted in many students now being able to continue their studies at higher and university level. This also implies that the school has created better chances for its students. The School Board has submitted this plan to the parents, who have embraced it. There is also support from the side of the County Council and the local politicians to realize this plan. An appointment has been made with the Chairman of "Kenya naar School" to meet the parents in February 2016 to hear their wishes and desires and to discuss these plans further. The school has to make a gradual transition from a mixed school to a boys school. It is not necessary to do this straightaway. Some improvements to the school can be done already now, benefiting both boys and girls in terms of facilities (with hopefully positive outcome on the academic results), before the transition is set into motion. This transition will ultimately have to be completed when the school will have dormitories, allowing the boys to stay at school. 1. Completion of the laboratory that could not be completed because of financial reasons. 5. Improvements to the existing classrooms. 6. Construction of an Administrative block. 7. Connection to the power grid. The Board of Seiyo School has visited several schools in the neighborhood (amongst which was Plateau Girls Secondary School) and is in the process of asking quotations from a number of contractors, including those who worked with the "Kenya naar School" Foundation in the last phase of Plateau Girls' School and Kiplombe Secondary School. Consequently we expect to be able to present a more accurate estimate soon. Apart from contributions by the "Kenya naar School" Foundation, we can expect contributions from the County Council Development Fund (estimated at: € 10.000,00 for the next 5 years). Moreover the income of the school is expected to go up once the first improvements have taken place and the parents are convinced that the developments are positive. The mobilization of the parents will therefore be an important task for the Board. Seen the experiences from Plateau Girls' School, the Foundation will be able to play a positive role in this matter.